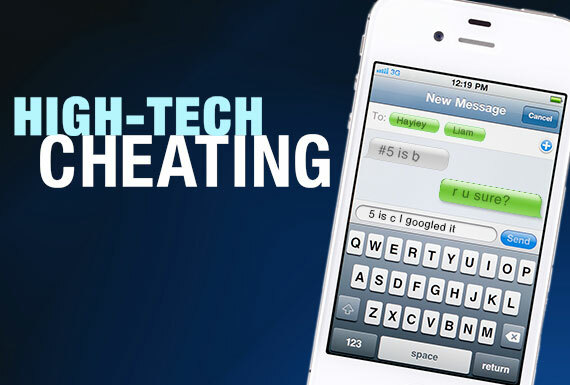 With the proliferation of mobile devices and instant access to the internet, cheating has become easier than ever. What can educators do to stop it? This article originally appeared in T.H.E. Journal's August 2013 digital edition. The 21st century classroom is a wonder of online tools and content that students can access from an ever-evolving range of personal mobile devices with capabilities only dreamed of less than a decade ago. (Just imagine: The first iPhone was released in 2007!) But the anywhere/anytime access these devices provide to vast web resources, sprawling social networks, and real-time communication has spawned a new kind of cheating in K-12 environments--an easier, tech-enabled version of bad behavior that is as old as the classroom, but with the potential to compromise virtually every aspect of modern student assessment. What we're calling high-tech cheating has been characterized variously as a trend, an epidemic, and a plague. But it might be something even worse: a paradigm shift. More students than ever are using information technology in ways that break the rules of academic integrity, and a shocking number of them don't seem to think they're doing anything wrong--well, not that wrong. They're taught, after all to use these tools and resources to work together on class projects. They swarm over shared Google Docs, interact on assignment-related Facebook pages, and coordinate team efforts via text message. For digital natives, some have argued, sharing information is so natural and so often encouraged that lines that were once so bright and clear are blurring. Things get even blurrier when you factor in the examples presented by educators in headline-grabbing revelations of their own disrespect of the rules. In the past couple of years, teacher-related cheating scandals have erupted in Atlanta; El Paso, TX; Washington, DC; and Columbus, OH. According to the US Government Accountability Office, 32 states have reported "canceling, invalidating, or nullifying test scores from individual students, schools, or districts because of suspected or confirmed cheating by school officials [emphasis ours]" for the 2010-11 and 2011-12 school years. The web is a rich resource of shameless cheating strategies. YouTube is rife with examples. "How to cheat on all of your tests," reads the listing for one video. Click on it and you get step-by-step instructions on how to copy a beverage label and replace all the nutritional information with, say, your physics notes. "Make sure you get enough glue on the bottle," the video advises. "Once you have this done, you'll have your notes, but nobody will know except you!" Web developer Josh May makes this particular process even easier on his Pirate Weasel website, where he provides a printer-ready water bottle label onto which notes can be cut and pasted. But the high-tech cheating ball was already rolling way back in the digital Stone Age of 2004, when this activity was briefly called "cybercheating." At that time, Santa Clara University (CA) researchers Stacey Conradson and Pedro Hernández-Ramos declared that "…the preponderance of statistical and anecdotal evidence underscores several disturbing trends, indicating that cheating at the secondary level is not only occurring more frequently, but that students are using much more sophisticated methods for their transgressions." Five years later, a 2009 report from Common Sense Media included the results of a national poll conducted by the Benenson Strategy Group, which found that more than 35 percent of teens admitted to cheating with cell phones and the internet. The cheating involved texting answers to one another during tests, using notes and information stored on smartphones, and downloading papers from the internet to turn in as their own work. So if high-tech cheating is nothing new, why haven't we solved the problem? According to Doug Winneg, CEO and founder of Software Secure. "On one level, the issue is simple. If left unchecked, students cheat; properly proctored, they don't. What complicates the situation is the evolution of extremely powerful, mobile technology and its ability to connect students to the web and to each other." Winneg's company has been using technology to keep students from cheating since 1999, when it developed a patented software system that locked down student laptops and automatically turned them into secure test-taking terminals. In 2006 the company began focusing on the burgeoning world of online education and added remote proctoring systems to its product lineup. The company's Remote Proctor Suite is a high-tech solution to a high-tech problem. The system authenticates a student's identity biometrically and then records video and audio of the exam environment. (It's called a record-and-review online testing model.) Winneg's company found a market for this solution because of the acute needs of online programs to prove their credibility. But he argues that a vigilant proctoring strategy can also go a long way toward solving high-tech cheating problems in traditional environments. "The students know we're watching, because we tell them we're watching," he says. "Watching, listening, and recording. We clearly articulate what we're doing when we proctor an exam so that the students won't feel tempted. The deterrent power is incredible." The long-term solution to the high-tech cheating problem, Winneg says, must include thoughtful and consistent monitoring of exams (whether online or in the classroom) coupled with a well-understood, published exam policy that spells out for students what is and isn't allowed. A Southern California high school junior who asked not to be identified says that her experience suggests that a ban alone won't do much to curtail cell-phone-enabled cheating if the teachers aren't paying attention. "I have a lot of teachers who say, 'Put your cell phones in your backpacks,' but then just sit at their desks when we take the tests," she says. "And they never look up. It's just really easy to cheat in those classes. You just keep your cell phone in your lap under your desk and look down. I don't see people doing it all the time, but it definitely happens." Cell phones are not permitted in public high schools in New York City, and yet cell-phone-enabled cheating grabbed the spotlight last year when a group of students at NYC's Stuyvesant High School were caught texting photos of test pages and sharing information about state Regents Exams--while they were taking them. Stuyvesant is one of the country's most prestigious public schools. According to Thomas Zadrozny, who as a junior reported on the incident for the school newspaper The Spectator, "It's a very high pressure environment, and a group of students turned to cheating as a way to get through it. We dubbed it 'the cheating ring.' The way it worked was, one student coordinated efforts by a bunch of them to exchange answers on exams, both in school and on state exams, at the end of the 2012 school year." Zadrozny's story ("Stuyvesant Cheating Ring Exposed"), which he cowrote with Kaveri Sengupta and Jordan Wallach, with reporting by Arielle Gerber, appeared in The Spectator on Sept. 9, 2012. The story notes that the students weren't caught, precisely: One student, who was apparently included in the cheating ring reluctantly, came forward and told administrators that students were sharing answers via cell phones. "It was common for teachers not to monitor exams very well," Zadrozny adds. "I'm not blaming them, but they do need to wake up to the reality that this is going on, and they need to be more vigilant during a test." This advice could be especially important for New York City schools in the future, given that nearly every candidate currently running for to succeed Mayor Michael Bloomberg, who instituted a ban on student cell phones, is promising to drop the ban. Lifting it, they say, would allow parents to make sure that their children are safe. Zadrozny, who heads to the University of Washington to start college this fall, insists that the much-publicized incident doesn't reflect the character of his school. "You shouldn't get the idea that everyone in the school does it," he says. "This was the largest example, but this is a huge school, and most of the students are on the right path. And this isn't just a Stuyvesant thing. This is happening at every high school in the country. Our students just got caught." Not all students plagiarize, but enough of them do to justify some of the hyperbolic language characterizing this form of high-tech cheating. Each year, Turnitin, a company that has become something of a household name among plagiarism-detection services, conducts what's called a matched content analysis. In 2012, the company searched 38 million student papers for matches to online content. About 10 million of those papers were written by secondary school students; the rest were written by college and university students. Among the papers searched, the company turned up 156 million matches to previously published online content. Unsurprisingly, the number one online source for those matches was Wikipedia. Among the secondary school papers, the second most popular source of those matches was Yahoo Answers. "Think about that!" says Jason Chu, senior education manager at Turnitin. "You have students who are writing papers, and their version of doing research, which is really informed by their social habits, is to go to a social sharing site. What's the credibility behind Yahoo Answers? It doesn't make any sense, but it sheds light on the challenge students are facing when it comes to research online." For many students born in the digital age, Chu says, research means search. "The irony, of course, is that there's so much information available to students online that they don't know how to parse," Chu says. "They don't know how to interpret it, how to evaluate it, how to make sense of it." And they don't really understand who owns it. "Copyright and intellectual property rights are often a fuzzy concept for students," Chu says. "I've had instructors tell me that students who've been caught turning in papers they purchased online are actually confused about why they were in trouble. They'd say, 'Sure, I bought this, but it's mine. What's the problem here?' "
Companies like Turnitin are providing what increasingly might be considered standard tools in K-12, but there are some misconceptions about how these tools work, Chu says. "We don't actually identify plagiarism," he explains. "There really is no true plagiarism-detection service out there, one that will unequivocally and with full confidence identify plagiarism. You can't teach a machine to parse intent. What all plagiarism detection services do is identify and compare matched content. It's really up to the instructor to look at the those matches and decide whether it's a case of poor citation, a student who simply forgot to put in the quotation marks, or did they copy the content in a way that's not appropriate." Making that job more challenging, adds Chu, is the fact that "this generation of digital natives writes every day. Previous generations would write for assignments. Nowadays, students are writing all the time. They're text-messaging. They're sharing on social media sites like Facebook. But they're writing, and it's easy for them to conflate content information that they share, that they use and access every day, and apply that perspective to how they produce school papers." Digital natives are also so used to working together online that there's often genuine confusion about the difference between cheating and collaborating. "Teachers need to be mindful of the collision of students' social media activities with their school activities," says Chu. "It's the same tools, the same process, the same screen, the same interaction. But there are different rules. Teachers need to establish clear parameters and show their students that there's a difference between cutting and pasting in a status update on Facebook and original material written for a class blog or discussion forum." Students in hybrid classrooms are especially vulnerable, Chu believes. Confusion is almost inevitable in classes that conduct business both on and offline--unless teachers make it a point to clarify distinctions. The Southern California high school junior puts it this way: "It is confusing! A lot of my teachers tell us to work together on our homework, but I think they're more trusting about us working together in person, and they don't want us doing it online so much. Or they do want us to work together online, because that's how we do it in that class. And we just do it that way anyway all the time. But it's not cheating; it's just the way we do our schoolwork." All this line-blurring can be especially challenging for some teachers, says Neal Taparia, cofounder of online bibliography service EasyBib. "It's difficult for educators who were in school in a pre-internet world to relate to how students are collaborating and researching today," he says. "It's an entirely different world, and I'd almost say that they need to become students again to effectively understand what students are doing and how best to address the problems they face." "Digital natives are attuned to sharing files and helping each other out," says Dorothy Mikuska, a veteran high school English teacher and founder of ePen&Inc, which makes the PaperToolsPro bibliography tool. "We've taught them well to collaborate in this way. But the transparency of doing their own work is not as significant to them. They're not as motivated to be as careful about citing sources." "Kids do learn in groups today," says Software Secure's Winneg. "They live in a highly connected world, and it's second nature for them to go online to get answers and to reach out to friends for help. And many teachers are encouraging them to do that in their daily schoolwork. So this confusion between collaboration and cheating is about more than just monitoring student test takers. This is a learning generation, but they're used to having instant access to information online--which is the good news and the bad news." Cheating isn't a new phenomenon, of course, but never before have teachers had to cope with such powerful tools and enticements. Although technologies such as adaptive testing, which gives different questions to each student, and test-response analysis, which looks for test-answer irregularities, are emerging, the most effective current strategies for coping with the problem depend primarily on awareness, understanding, and a relatively low-tech set of best practices. 1) Prohibit cell phones in the room during a test. The modern smartphone is "the lock-pick of cheating," says Doug Winneg, CEO and founder of Software Secure. The devices can store large databases of test answers, send and receive answers among friends in real time, and connect to Wikipedia. If the school policy allows students to bring cell phones to school, consider collecting them at the door on test day. 2) Proctor exams properly. That means walking around among the desks, not sitting at the front of the classroom. "Left unchecked, this generation cheats; properly proctored, they don't," says Winneg. Cell phones open a huge door to the internet, but they fit in the palm of your hand and are easy to hide. It's just not enough to tell students to put them in their backpacks or even to confiscate them at the door--students might have another hidden away. 3) Establish a clear set of rules. It's obvious, even to digital natives, that texting test answers to each other is cheating, but how about reaching out on a social network for help from a classmate on a homework project? The line between collaboration and cheating is truly a blurry one for students using online educational resources, Winneg says, and policies vary from class to class. Teachers who understand the potential for confusion should draw a clear line with written policies and those policies should, if at all possible, be schoolwide. 4) Demonstrate the difference between research and "search"--literally. Let students look over your shoulder while you research and write a short paper, recommends Neal Taparia, cofounder of EasyBib. "When you learn tennis, you're seeing someone swing the racket and you can really see what's going on," he says. "But students never see how their teacher would like them to go about discovering sources, connecting the dots among sources, and developing their own ideas. If you could teach that by example, I think it would be a unique step in the right direction." 5) Focus on developing information literacy skills. "I think most K-12 students think that plagiarism is just handing in someone else's paper," says Dorothy Mikuska, a former high school English teacher and founder of ePen&Inc. "But the idea of citing sources and properly attributing them is not something that they necessarily connect to plagiarism." Another important issue, she says, is citing the right sources. "You have all this user-generated content out there, but students don't differentiate." One of the most effective ways to address and reduce the instances of digital cheating is to promote, teach, and model positive digital behavior in three key areas: digital literacy (critical thinking when watching, interacting with, and creating media), ethics (codes of conduct), and safety (understanding digital risks, from malware to dangerous people and information). Here are a few resources to help schools promote the teaching of such skills. 21st Century Information Fluency Project (21CIF) provides professional development and resources for educators to help students locate, evaluate, and use digital information more effectively, efficiently, and ethically. Cable in the Classroom is the education outreach arm of the cable industry, with a mission that includes promoting digital citizenship. Its website offers a number of resources for educators. The Center for Media Literacy is an organization dedicated to promoting and supporting media literacy education as a framework for accessing, analyzing, evaluating, creating, and participating with media content. Media Literacy Clearinghouse is operated by digital literacy expert Frank Baker. The site offers an aggregation and evaluation of media literacy teaching resources. New Media Literacies, a research initiative based within the University of Southern California's Annenberg School for Communication, looks at the challenges for educators and students living in a "participatory culture." The site includes white papers and teaching guides. SOS for Information Literacy, a web-based multimedia resource funded by the Institute of Museum and Library Services, includes lesson plans, handouts, presentations, videos, and other resources to enhance the teaching of information literacy.